My name is Adrian VanAswegen and I am the Lead Pastor of Calvary Assembly of God, Brookings. I want to personally welcome you to our website! I’m so glad you’re here! My wife, Lisa, and I love southwestern Oregon, especially this great area along the beautiful Oregon coastline and beaches, pristine rivers, and majestic redwoods! To tell you a little about me, I am originally from South Africa, I am the son of a preacher, who felt the call of God on my life at an early age. I came to the United States as a young man, finished my studies and pastored a small congregation in Port Orford until I was called to Brookings. I became the Senior Pastor at Calvary Assembly in 1977, where I still hold that position today. 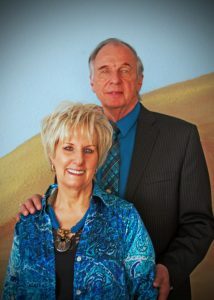 Together with my wife, Lisa, we lovingly minister to our flock here in Brookings. We are so excited that you have chosen to visit our website! You may be looking for a church home or a member of our church already. We hope our web site helps you get to know us better. We are so excited about what God is doing at Calvary Assembly of God. To serve you even better, we would love to shake your hand, give you a hug and share some really meaningful conversation together. Our first priority at Calvary Assembly of God is to build lasting relationships that share a common pursuit to follow Jesus Christ. If a big hug isn’t your thing… you can simply grab a fresh cup of coffee in our Calvary Cafe and enjoy the music. Maybe you’re uncertain about where you stand with God, maybe you’ve been hurt deeply, it’s just possible you’ve been discouraged to jump into a church because of doubt that it’s genuine and incapable of having value for your life. Let me assure you that God is real and so is His love for you. We’re all on a journey to discover how God’s word can transform our lives. If you have questions, if you’re feeling fear, if you’re desperate for love, or maybe you’re just looking for a new church to be a part of, give us the opportunity to love on you a bit and share our story with you. You may find that many of us have far more in common with you than you could ever imagine. We invite you to come and join us on Sunday mornings for worship or you may join in on one of our various bible studies or special events, we want you to feel at home here at Calvary Assembly of God and we invite you to walk with us on this Journey of Faith. Becoming Biblically minded is helping us and allowing us to find peace as we live by God’s Grace. Calvary Assembly of God is a place where we are learning to do just that, love God with our whole being and loving each other. We will teach you God’s word, we will pray with you and help you as you search for the answers to life’s most perplexing questions. We do not pretend to have all the answers, but then again if we did who would need faith? We recognize that it is essential for us to join together as a family and walk through this world with the love, support and encouragement of fellow followers of Christ. We invite you join with us. We are still learning and still growing in how we do the things that God is calling us to do. Calvary Assembly of God was established here in Brookings in 1951! We love our church and truly enjoy ministering at the “518 Fir Street, Calvary Assembly of God” and we’re so excited about the opportunities the Lord has blessed us with! Lisa and I look forward to meeting you soon. Welcome to Calvary Assembly of God, a place where we are learning to see as God sees and love as God loves. We are a church on a journey to grow in Christ.